tran·si·tion (noun) the process or a period of changing from one state or condition to another. It’s a phase filled with lots of change, which requires additional work that you didn’t plan for, while mandating a heavy time investment on forward-thinking. Transition also possesses a component that most leaders [and I] despise — a lack of full control on the outcome. Let me literally sum up a transitional phase for you; Hard Work + Innovation + Risk = The reward of staying relevant in an ever-changing world. Most leaders don’t want a new list of things to spend their organization’s time and money on learning to adapt to. Most leaders would rather spend the same amount of time working against whatever it is that is changing. This is why those who do adapt first — WIN. I’ve decided not to act like most leaders who resist change. I don’t want you to be like most leaders either. I want you to WIN. Recently, I exited a company that I passionately built with a transformational team of people over the past seven years. I’m fortunate that we had a successful run which allowed for me to participate in a healthy exit, not only in the financial terms but also through the relationships I’ve built with my partners and our team. Since then, I’ve been in one of those “head-down transitions” — working hard to heavily study and calculate new media trends in the marketplace. I don’t know that I’ve ever been in a such a lengthy transition. I’m the type of person that has his entire home in place the day after my family and I have moved. In business, I know that I work best with a narrow yet diverse focus on accomplishing a BIG goal for the brands that I’ve decided to invest my family and I’s time, money and passion into. I had that focus for seven years with my previous brand; Iron Tribe, which we were fortunate enough to build from one garage to more than 40 locations nationwide, garnering INC. 5000 honors for three straight years, as one of America’s Fastest Growing Companies. I’ve developed the same focus over the past year, in building and launching the GLOW on-demand beauty app brand with my wife and Co-Founder, Yazmin. We are now growing into new markets in the southeast, with Yazmin as CEO. However, I’ve also had a deep desire to start a new brand in the sports media world, which is entering a very transitional phase of its own. This is a place where I’ve been wanting to find a narrowed focus for me to pour myself into. For more than eight months, I have invested more than 2,000 hours of research and development (R&D) around two passions. First, the impending decline of traditional media and its effect on the college sports financial bubble. Second, the student-athlete’s life beyond sports. This R&D phase has empowered me to hone in on the impending problems relative to these two passions I referenced above, focusing on the development of tangible solutions toward these issues, for those who’d elect to work with me. What’s in it for those I am going to serve? I’m going to help you attack several imminent problems in a head-on manner. Through the solutions I’ve developed, college athletic departments will be able to further protect their brand on social media, while increasing their social media brand reach for both recruiting and monetization purposes. The college athletic department and the university as a whole, maintain historic brands that they care deeply about preserving and enriching in any way possible. It’s the life-blood of both their enrollment and their alumni, which are the two of the primary core groups of funding for the institution. The university’s brand control was once limited to content they could sign off on with exclusive distribution by traditional media outlets—i.e. the press, advertising and live sporting events that involve or revolve around their university. That may not the case much longer. Social media has created “brand tentacles” via the representative social media account channels of the university brand itself. These tentacles are evident through the individual social media accounts of the personal brands who represent the big brand they are associated with (work for, play for, attend, etc.) — the brand ambassador social media channels. In college sports, the social media accounts of the institution, the athletic department, the teams, the coaches and yes, the student-athletes, are each brand tentacles that represent the complete brand of the university as social media influencers. The college athletic department has decided to be reactive about this for the most part, which is no surprise because when you look at their revenues and the size of their organization. They are acting like 99% of the bureaucratic organizations that have chosen the same route — TO REACT instead of TO ACT — resisting CHANGE. This is no different than how we’ve seen bureaucratic record labels act during the redefinition of music distribution over the past decade. Remember — The majority despises transition. This creates an opportunity for those who embrace these changes in sports media, to become pioneers leading their university into the future. These big collegiate sports brands have extremely large fan bases, which is their number one asset as a business. Regardless of what business you’re in, THE LIST [of prospects, customers, former customers, etc.] is your most valuable asset, regardless of your product, services or any other assets you own (ie. tech, robots, IP, patents, etc.). But has it really always been like this? No. Traditional media has not always funded college athletics to the degree it does today (Billions). It has evolved to this point over the past couple decades, from less than 10 networks broadcasting sporting events in the early 1990s to hundreds of television networks broadcasting sporting events in the present. This has translated from millions to billions of media rights dollars over the same time span. The early adopters in the television game won (ie. the Notre Dame NBC Deal, the ESPN SEC Network Deal, etc.) while many others lost not necessarily because they weren’t early adopters, but because of the conference realignment arms race that began to take place because of the massive media rights dollars at stake (ie. “the former” Big East Conference). Things are about to evolve even faster for two reasons; (1) the way in which viewers (subscribers) consume content is constantly evolving and (2) businesses are spending their advertising dollars differently. Each day, more viewers consume content on their mobile device instead of their television. This on-demand consumption habit has us viewing multiple pieces of content at once, creating a real competition for attention, from ALL content producers big and small. We’ve gone from watching an entire sporting event on one of the few channels that televised these events in the early 1990s, to DVR fast-forwarding through commercials on one of the hundreds of channels that televised these events in the early 2000s, to watching content like The NFL Red Zone and/or on-demand highlights that live within the channels on our customized social media feeds here in the present. While the traditional media networks have adjusted their delivery mechanisms to provide viewers with mobile content via social media channels and network-specific apps they’ve launched, the television network’s ability to monetize this content through advertisers and subscribers will look much different in the future. Traditional media networks will simply not be able to continue to fund college athletics to the degree they do today, in the years to come. These networks are already having trouble subsidizing their own talent and the current budget of media rights fees that they’ve continued to expand as an actual bet on what had been working. Due to this evolution of media, “what had been working”, is not working anymore. This should matter to the university and its athletic program, because it means that one of their budget’s leading revenue drivers (media rights) will be changing dramatically as well. This revenue driver has allowed the biggest schools to participate in “arms wars” to have the highest paid coach or biggest stadium. This bubble is about to burst. Throughout my journey in studying this fascinating problem, I’ve spoken with several powerful college athletics leaders, both at the conference and university level. One thing is clear — the majority don’t see what I see and they each seem to enjoy the chance to passionately refute all of the above. I would assume that the tone I’ve heard from the majority of these administrators and leaders, is similar to that of record label executives just over a decade ago before their industry completely got flipped on its head. I would also assume that there are those college athletics leaders who see this problem clearly and will rise as the innovators who are ahead of the curve. The leaders who embrace this transitional phase and decide to work hard, innovate and take risks, will reap great rewards for their university. These pioneers are the leaders I want to serve with the new brand I’ve built — Influencer (INFLCR). The impending decline of traditional media will not only effect the college sports media financial bubble. It will do the same in professional sports media and many other media verticals outside of sports. You’re already seeing this with both Hollywood and Television content in various ways, as Netflix, Hulu, Amazon and many others are producing their own content to cut out these content owners who used to have the leverage of being the only ones who can distribute the content — that’s over. If you can create and produce your own content, you can distribute it yourself. You don’t need “them” any longer. To revisit the music industry analogy, the record label’s stronghold over its signed talent was not production; it was distribution. The moment that distribution power was put into the artist’s hands, was the moment the record industry would be changed forever. There is a reason that I want to focus on college sports instead of many other verticals that will also be disrupted by the decline of traditional media — The Student-Athlete. 1. Less than 1% of the 1.5 million high school football student-athletes, actually realize their dream by signing a national letter of intent to play big-time college football. 2. Less than 1% of these 15,000 big-time college football student-athletes, actually realize their dream of playing professionally in the NFL. 3. Yet almost 100% of these college football student-athletes, believe they’ll have a sustainable NFL career. 4. For those who do make it to the professional ranks, the average NFL career is less than 3 years. 5. More than 90% of big-time college student-athletes [in all sports] use social media for more than 60 minutes each day. 6. Once a 4 or 5-star recruit signs a letter of intent with the big-time college of their choice, they become a social media influencer with more than 10,000 followers. This also occurs once a big-time college student-athlete steps onto the field or court as a starter. 7. More than 30% of big-time college football student-athletes are social media influencers with over 10,000 followers on at least one social media platform. 8. Their followers are the present fan and student base for their university, along with the younger, prospective students and recruits who look up to them. 9. Less than 1% of these college football student-athlete influencers are verified on social media, with as many as dozens of fake accounts in their name. I know that many of the people who read this, may already be aware of the majority of these statistics, but that does not warrant me skipping over this. It is indeed the new paradigm. Through the solutions I’ve developed with the Influencer (INFLCR) product and suite of services, college athletic departments are empowered to further protect their brand, while increasing their brand reach for both recruiting and monetization purposes. Both the reality of traditional media’s decline and this fact set above, have motivated me to create the Influencer (INFLCR) offering. INFLCR is a technology product and suite of services that equip innovative college athletic departments with critical social media tools that empower their student-athletes as brand ambassadors for their university and essentially, for themselves. **This is not a prophecy or a sales pitch. Its the navigation manual for the new paradigm. *Should the university and its athletic department choose to be proactive leaders with their social medias, they have the opportunity to extend brand reach in a direct manner. This opportunity enhances recruiting and creates new content monetization potential that they completely own the rights to. With the INFLCR Dash, the athletic department can view live data and performance of each social media channel that represents their university’s brand. -View a live followers count for each team, coach and student-athlete social media channel. -Identify the student-athlete influencer social media channels that posses more than 10,000 followers. -View live verification status for each student-athlete influencer social media channel. -Consume a rolling feed of previous posts by student-athlete influencer social media channels. -Receive alerts for posts with profane language and inappropriate content. 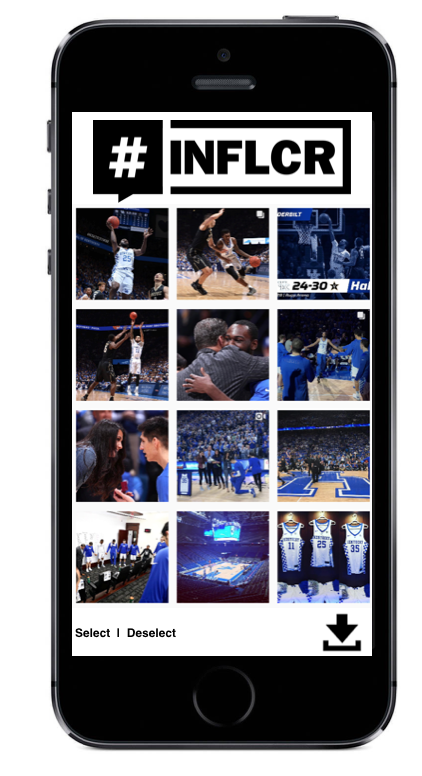 -Record live broadcasts your student-athlete influencers are broadcasting on social media. -The INFLCR team assists in obtaining verifications for specific student-athlete influencer social media channels that are presently not verified with multiple fake accounts in the same name. -Live data surrounding the social media channels that represent the university’s brand. With the INFLCR ContentHub, the athletic department can equip their staff, coaches, student-athletes and alumni with content that the media staff is already producing. -Media staff can upload any content that they shoot on behalf of the university. -Media staff can assign specific permissions for each piece of content, so that a specific group, team or person can gain access to it. -Athletic department staff, coaches, student-athletes and alumni can download any content they have permissions to, so that they can use it in their social media posts. -The INFLCR creative team builds a content creation strategy for media staff to follow in creating content that representing social media channels will want to post — this content will engage and grow the university’s overall following (THE LIST). -The INFLCR creative team builds a monetization strategy around the content strategy, to engage existing traditional media sponsors for the school (signage, radio, etc.) for fees based on the audience size that will consume this content through the university’s social media accounts. 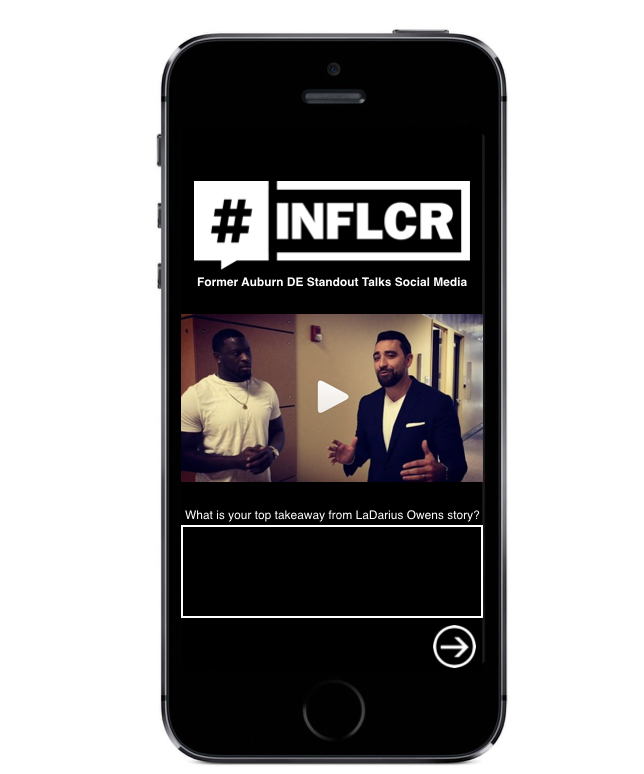 -Staff, Coaches, Student-Athletes + Alumni can access the INFLCR ContentHub app on their mobile device, download media they have access to, and use it in posts on their personal social media channels. With the INFLCR U, the athletic department can follow a strategy for its team accounts, while developing its student-athletes with social media skills that they can use during their time playing for their university and throughout their career beyond college sports. -Weekly video education for student-athletes to consume from former athletes and social media experts with a practical blueprint for each lesson. -Ongoing educational resources for the university staff and its student-athletes, from the INFLCR team. LaDarius Owens started at DE in two Auburn University’s BCS National Title Games, but did not have success in the National Football League. He’s used social media to build a successful financial planning business. As a brand ambassador, the student-athlete has the opportunity to develop an important social media skill that they can use to create a responsible personal brand on behalf of their university as well as for themselves. The student-athlete’s social media skills and their individual account followings, culminate into something they’ll be able to leverage well beyond their years playing at the university they attend. There are DO’s and there are DON’T’s pertaining to the management of your social media account. The majority of university leadership have made the choice to be reactive followers instead of proactive leaders with their social medias and thus, they only focus on the DON’T’s. Being reactive, translates into hoping that the student-athletes who represent your institution with followings as big as 500,000, won’t become the next horrific social media case study of what not to do as a student-athlete on social. The reality is that each student-athlete is on their personal social media accounts for at least 90 minutes per day. With no focus on the DO’s, when it comes to social media, it’s inevitable that these student-athletes will violate the DON’T’s, along with missing out on countless opportunities to build a social media following that can benefit both their university and themselves. With proactive leadership on behalf of their university and their student-athletes, college athletic departments can change the game by focusing on the DO’s. Closing Context — Listen to the market and you’ll know it is time to change! If I’ve learned anything in my 14 years as an entrepreneur, it’s that I don’t KNOW. When you launch a new business, you make plenty of assumptions. In this case, I’m assuming that there are enough proactive leaders in college athletics, to be able to serve at least 3 athletic departments as my pilot clients. I also realize there are pain points that I do not fully grasp. Thus, I don’t want to launch Influencer (INFLCR) with more than 5 pilot university clients for the 2017–18 athletic year. I want to be able to jump in with what we can offer with our existing product and services, but also with the flexibility to refine our product and services to establish a process that is both effective and scalable. Finally, I am humble enough to take a LOSS. Whether its a financial loss in the form of my up-front investment of lower pricing to ensure 5 pioneering university leaders experience the value in what we are offering, before investing the proper dollars into our priceless product and services… or a loss in the form of not hearing enough YES’s from college athletic departments and having to recalibrate my approach. I’m confident that I will find the proactive leaders to give these problems the attention they deserve in the present, by bringing in my Influencer (INFLCR) product and suite of services. The reality is, that I’m passionate about The Problems and instead of staying comfortable by pursuing lower-risk business opportunities that have come my way… I’m choosing to build the first set of solutions for these problems. My goal is to sign 5 pilot clients by June 30, 2017. If I do not reach my goal, I will step back, evaluate and recalibrate. I’ve already got verbal commitments from the University of Alabama and the University of Kentucky. I’m very close to receiving the same words to move forward with Ohio State. There are several other universities I’ve visited. with who, like these schools, appear to be the proactive leaders that are not resistant to transition and are prepared to be pioneers. I’ve never been a “problems guy” — I’ve always been a “solutions guy.” I enjoy learning about the problems so that my team and I can find the best ways to solve them. I hope you’re one of the proactive leaders who will join me in this transition from traditional media that you get paid rights fees for, to social media that you own complete rights to, in the world of college sports.